Earlier this week, the Fat Quarter Shop released a new shortcut quilt pattern: Charm Pack Cherry. Plus all charm packs are on sale through the weekend. Check out the latest free pattern: Layer Cake Lemonade plus all layer cakes are on sale from the Fat Quarter Shop. Welcome to our final block for our Glorious Autumn Block Party. 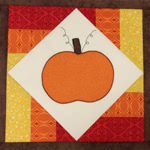 Today we have Lisa Sipes as our featured designer and a new class from Craftsy to tell you about too. Welcome to Day 44 of our Glorious Autumn Block Party. Today we have Kiera Vanella as our featured designer and 40% off savings from Fort Worth Fabric Studio too. Welcome to Block 43 of our Glorious Autumn Block Party. Today we have Ebony Love as our featured designer and a new class from Craftsy to tell you about too. Welcome to Block 41 of our Glorious Autumn Block Party. Today we have Heather Jones as our featured designer and Contemporary Cloth has a fantastic 25% off Super Deal too. Welcome to Block 40 of our Glorious Autumn Block Party. Today we have Kim Lapacek as our featured designer and the Fat Quarter Shop has a fabulous Super Deal. Be sure to check out Kim’s give-away too! Welcome to Day 38 of our Glorious Autumn Block Party. Today we have Erin Russek as our featured designer and 40% off savings from Fort Worth Fabric Studio too. Hi everyone! Welcome to Day 35 of our Glorious Autumn Block Party. I am today’s featured designer and don’t miss this week’s fabulous Super Deal and Pre-Black Friday savings from Eleanor Burns’ Quilt in a Day. Here is Block 34 of our Glorious Autumn Block Party. Today we have Megan Ziegler as our featured designer and the Fat Quarter Shop has a fabulous Super Deal. Be sure to check out Megan’s give-away! Welcome to Block 33 of our Glorious Autumn Block Party. Today we have Mickey Depre as our featured designer and ChristaQuilts invites you to shop their Bargain Bin for fabrics under $6 per yard. Welcome to Block 31 of our Glorious Autumn Block Party. Today we have Melissa Dunworth as our featured designer and Contemporary Cloth has a fantastic 35% Super Deal too.